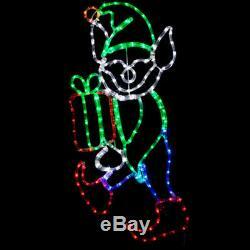 LED Rope Light Christmas Elf with Gift. All-Weather Powder Coated Steel Frame. Premium UV Enhanced LED Ropelight. Long Life Class "A" LED's. LED's spaced 1 inch Apart for Maximum Brightness. 14.3 Watts; 0.13 Amps. 18 inches W x 38 inches H. The item "LED Christmas Elf with Present Outdoor Rope Light Holiday Yard Decoration NEW" is in sale since Sunday, November 19, 2017. This item is in the category "Home & Garden\Holiday & Seasonal Décor\Christmas & Winter\Yard Décor". The seller is "premiumchristmaslights" and is located in Saegertown, Pennsylvania. This item can be shipped to United States.